I wish I could do my nuptials again. Banarasi Wedding Outfits would have been on the top of my outfit list then. While I do have a few banarasi sarees in my closet all thanks to mummy darling, it’s not the same right? A wedding outfit, that’s something entirely different. But for the lucky few you who are still unmarried and are or planning your wedding, this post will give you some drool-worthy banarasi options that are sure to mess your head. But you are going to love it, I promise. What a showstopper look. Could you ever imagine Banarasi outfit to look like that ? There is no colour better than the traditional red bridal lehenga. Even if wedding seasons might have different trends from pastels to pop, you know there is one colour which will rule them all. Luckily, banarasi fabrics come in classic bright hot red with gold zari work which looks absolutely spectacular. Even if you leave the garment as is, the look of the fabric is so rich and traditional, it’s a great option to go for as your wedding ceremony outfit. What’s great about banarasi wedding outfits is that it is so versatile to use. If you go for contrasting elements in your outfits, you can pretty much reuse individual garment pieces with other outfits from your wardrobe. I especially love the deep blue banarasi dupatta with the contrast green lehenga. The colour captures so well in photographs. Monotone colour lehengas are back, and if you are planning on turning a banarasi saree into a lehenga, this is the time to do it. It’s trending this season + all you got to do is probably jazz up the dupatta to get a unique look. Love the powder blue Anarkali with the contrast fuschia pink dupatta. Doesn’t it look royal? Anju Modi has a beautiful bridal collection in banarasi fabrics. Her outfits do cost on the higher end, but you can draw a lot of inspiration for your wedding looks from her taste of colour combinations etc. Whether you team up the banarasi with a crop top, or without a dupatta, and focus just on the lehenga…the options for permutation and combinations are endless. Jayanti Reddy has some of the most eye catchy gorgeous banarasi outfits in her collection. She is the more affordable range high-end designer. So if any of you all have a range of 1-1.5lakh budget, you must check out her collection. 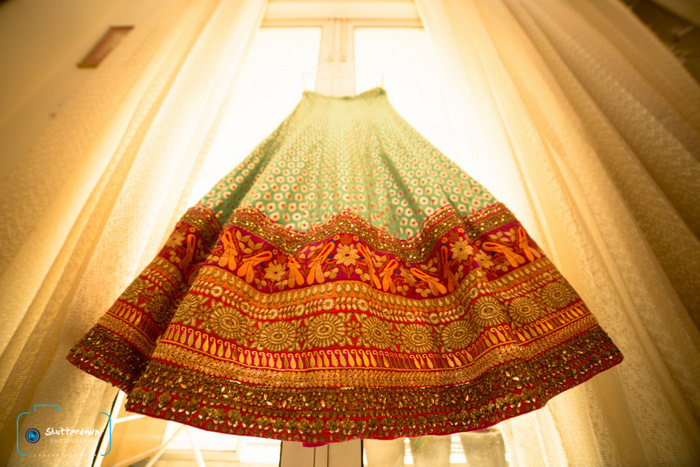 Do you want to wear a Banarasi Outfit for your wedding too?